In order to build on its successful performance on the 2017 Dakar, BFGoodrich® has prepared for the next edition of the world’s most demanding cross-country rally by developing a bespoke new tyre: the BFGoodrich® All-Terrain T/A KDR2+. The newcomer incorporates the latest technologies developed by the American off-road tyre specialist to deliver even greater versatility and resistance than its predecessor which, until now, stood out as the benchmark in the sport. But as the challenge thrown at them by the Dakar’s organisers gets increasingly tougher, the BFGoodrich® KDR2+ tyre provides competitors with a real 'plus'. "For the drivers, a good tyre is one that enables them to showcase their ability,” says Matt Hanlon, the engineer in charge of the BFGoodrich® KDR2+ project. “To achieve this, a tyre must be capable of responding perfectly to input via the steering wheel and playing a part in maximising the efficiency of the vehicle’s suspension. It also needs to perform consistently in a wide range of weather conditions and over a broad spectrum of surface types. A good tyre also needs to be reliable so that the drivers can focus on their speed and navigation." During the BFGoodrich® KDR2+’s design, the development team’s work focused on the two essential priorities for a Dakar tyre, namely versatility and reliability. The end-result is an all-new tyre that addresses the needs of two- and four- wheel drive cars alike. The BFGoodrich® KDR2+ tyre was engineered to combine enhanced grip with improved steering response and traction – especially on muddy ground – with no detriment to overall performance. At the same time, it carries over the very best of its predecessor to guarantee optimal efficiency when running on hard-packed or sandy terrain, climbing dunes or driving along aggressive, rocky trails in extreme temperatures (Dakar stages visit altitudes ranging from sea level to more than 4,000 metres!). Improvements made to the BFGoodrich® KDR2+ tyre include a new, more open tread pattern, while the casing has been reinforced to provide added protection against punctures. For the first time on the 2018 Dakar, the BFGoodrich® KDR2+ tyre will equip both two- and four-wheel drive vehicles and deliver the same level of performance for all the brand’s partner teams, irrespective of the type of vehicle they run. The BFGoodrich® KDR2+'s tread pattern has been completely redesigned. Compared with the 2017-generation BFGoodrich® KDR2 tyre for two-wheel drive vehicles, the KDR2+ features a more open tread pattern – especially along the shoulders – for enhanced performance on mud and soft ground. In comparison with the BFGoodrich® KDR tyre that was available for four-wheel drive vehicles in 2017, the KDR2+ stands out through its flatter profile which ensures a bigger contact patch, while its overall diameter has been increased by two millimeters. At the same time, the new KDR2+’s construction has been strengthened to cope even more efficiently with aggressive conditions. For each of the sizes in which the BFGoodrich KDR2+ tyre is available (two-wheel drive vehicles: 37/12.5-17 / four-wheel drive: 245/80-16), there is a choice of two compounds: soft (S) and medium (M). This will allow the brand’s partner teams to run different strategies as a function of the stages' respective profiles and teh prevailing weather conditions. The improvements delivered by the new BFGoodrich® KDR2+ tyre are the fruit of first class teamwork and data sharing. Indeed, BFGoodrich®’s latest Dakar tyre incorporates technologies that come from a wide variety of fields, from aviation, agriculture, civil engineering and mining, to trucks, light vans, conventional rallying and circuit racing. Working this way allowed BFGoodrich® to take advantage of the extensive expertise of engineers operating in a wide cross-section of areas. 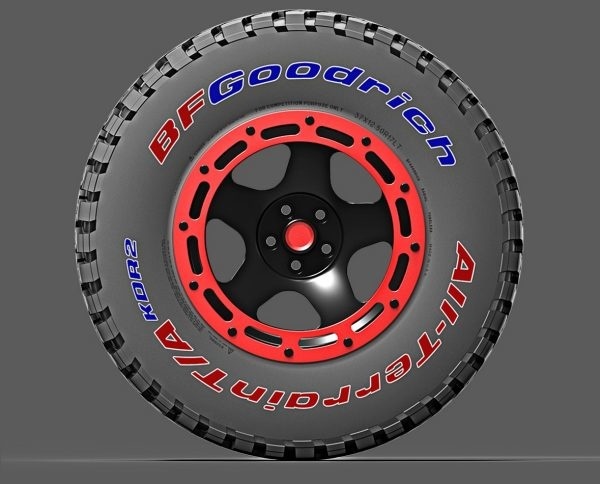 BFGoodrich®’s teams also worked closely with the brand’s partner teams and drivers throughout the development process. From the initial design phase and simulation work to testing in real-world conditions, X-Raid, Toyota Overdrive, Toyota Gazoo Racing and Peugeot Sport all played active parts and the result is a product that perfectly meets their needs. Testing is a key moment in any tyre’s development cycle. In the case of the BFGoodrich® KDR2+, the process began with finding a location that was representative of the terrain visited by the Dakar. The next step was to analyze the tyre’s performance in the sort of conditions competitors will actually face, which involved travelling to destinations as varied as Morocco, the USA, South America, China, Russia and Hungary. This work always needs to be extremely rigorous in order to make sure that the data collected during each phase is coherent and transposable. While simulators or artificial terrain can be used to investigate specific aspects of a tyre’s specification, nothing can replace actually running on the sort of diverse and unpredictable terrain that drivers can expect to come across during a typical Dakar. At the end of the day, however, the most effective test of any new tyre is the Dakar itself, when BFGoodrich®’s engineers work closely with the brand’s partner teams to harvest the indispensable data for fine-tuning its products, thanks notably to feedback from the drivers. After the finish, tyres are analyzed in detail, then dissected with a view to inspecting their casing. It is this rigorous process that has helped BFGoodrich® to forge the unique expertise it boasts today in the world of cross-country rallying.